Light Fall Scarf – This lightweight scarf with lace trim reminded me of something Radha would wear while dancing for Krishna. Always fully decorated, it’s said she was the most beautiful and sacred hearted woman in the universe. Peacock Bag – During one flute session the peacocks were so moved that they all began dancing with joy and excitement. At the end of the long dance the king peacock gave his feathers as an offering, which Krishna graciously accepted and used to adorn himself by placing them in his crown. Ghee from Art of Ghee – Krishna was quite a prankster as a young boy. One of his favorite things to do was steal butter from the milkmaids. He’s often depicted as a child enjoying a tub full of butter. Ghee is clarified butter and is used frequently in India. Ghee has a number of health benefits and can be used in a variety of ways. Bhagavad-Gita – Bhagavad-Gita means Celestial Song and is a section of the Mahabharata, one of the two major epics of ancient India. Written over 5000 years ago the Bhagavad-Gita is a conversation between the sage Krishna and the warrior Arjuna. It’s a message for people from all walks of life – it’s not a book about religion, but rather a book about living a meaningful life. Radha Krishna Statue (Murti) – Place this Radha Krishna statue anywhere you need a reminder of divine love and devotion, or that there’s not one right way to love, and that love occurs in a variety of forms and manifestations. Radha Krishna Sticker – Adorn a notebook, journal or your computer with a little Radha Krishna love. Recycled Varanasi Silk Sari – Repurpose as a headband, an eye cover during Savasana, or to brighten your sacred space. We have just a few of these boxes left, so get yours at ashibox.com/shop. September is dedicated to the great Mother Goddess, Durga. She’s the culmination of all of the gods different energies, and is the goddess of protection and strength. She was created to fight evil and embodies divine love, strength, courage and grace. 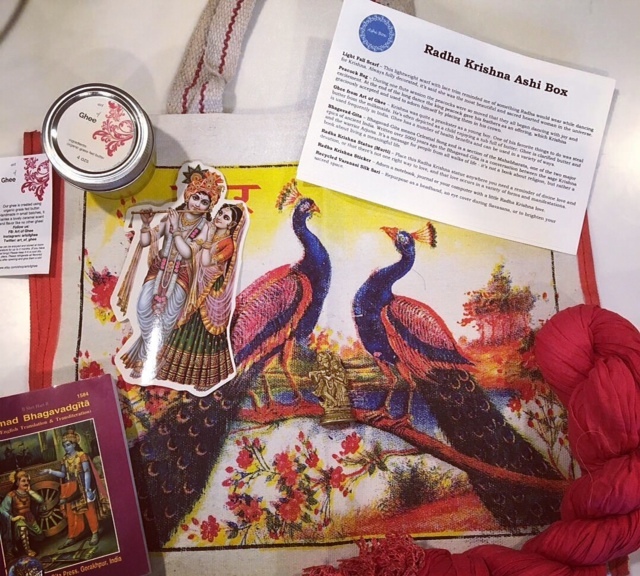 This Ashi Box will help you prepare for Sharad Navratri, the nine-night celebration of the many faces of Durga, which starts October 1. Join Ashi Box by 5:00pm Mountain Time on September 15th in order to receive this unique Ashi Box. All boxes will be shipped on September 20th, so sign up now at ashibox.com! If you have any questions, please contact us at info@ashibox.com. We have just added these leather journals to the Ashi Box shop. You can choose from either Ganesh or Om for your journaling, note taking, or painting pleasure. They’re 7″x5.25″x1″ and are full of smooth, blank paper and a useful elastic wrap-around. We have a limited supply, so get yours now at ashibox.com/shop.